There is no way to beat the heat better than with the V-Guard Enter HST table fan that is light weight and portable and can be carried any where you go. You can easily move this V-Guard table fan around your home and enjoy fresh and cool air even if you are relaxing with a cup of coffee in your balcony, patio, hallway and even your kitchen where you need it the most while cooking your favourite dishes for your loved ones. Along with being portable, the fan also maintains a sleek and classy design with attractive blades with rust proof 120 spoke grill guard. The V-Guard Enter HST table fan is safe if you have kids in your house as it comes with covered blades and closed wire mesh guard that keeps them away. 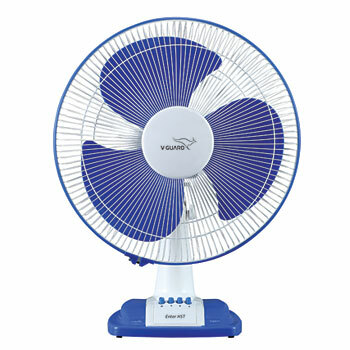 Additionally, this table fan comes with a speed of 2000 rpm and three different speed settings. Whether it is your small office or large home, this V-Guard fan is a useful choice. Rectangular base for better stability.